Water is one of the basic needs for all humans and it has been the center of world discussion in almost every international forum. The statistics worldwide gives a wider picture of the challenges faced by mankind to tackle water related problems. One community that contributes to the alarming global statistics is San Mateo, situated in the heart of Belize’s prime tourism destination, Ambergris Caye. For that reason the Rotary Club of Belize, working along with US expatriate Ann Kuffner, are leading a cause that will help minimize waterborne illnesses by providing water filter buckets. According to the United Nations (UN), 11% of the world’s population or 783 million people are still living without improved sources of drinking water. In fact, currently 2.5 billion people, including almost one billion children, live without even basic sanitation due to a shortage in water. The UN also reports that every 20 seconds a child dies as a result of poor sanitation; it is equivalent to 1.5 million preventable deaths each year. Worldwide, diarrhea continues to be the leading cause of illness and death, and 88% of diarrhea deaths are due to a lack of access to sanitation facilities along with inadequate availability of water for hygiene and unsafe drinking water. But with improved sanitation and safe drinking water, 90% of diarrhea related diseases could be reduced. 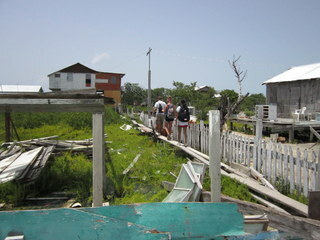 San Pedro Town, located on Ambergris Caye is no exception from the UN’s global figures. The San Mateo community represents approximately 5% of the total populace of Ambergris Caye, which stood at 11,765 in the last national census (2010). The 285 males and 283 females, of which 270 are children below the age of 18 years, are living in challenging conditions that include the lack of proper water access. Many residents still do not have access to a potable water line. Those with rainwater cisterns use the cistern water first, since their cost of potable water in San Mateo is a costly 55. cents per gallon. In January of 2012 a group of students from the Texas A & M University conducted a reconnaissance evaluation of potable water in the San Mateo Community. The evaluations included water quality field tests, water and sewer infrastructure assessment and a water quality survey. The alarming results confirmed what many have suspected for years - that the water was contaminated with coliforms. “The numbers were widely varied. From over 100,000 coliforms per 100 milliliter in drinking water to too many Escherichia coli colonies to count in the surface pools,” explained the report. Similar water tests were conducted in 2013 by Engineers without Borders, and those tests showed that the water contamination remains, with slow improvements. 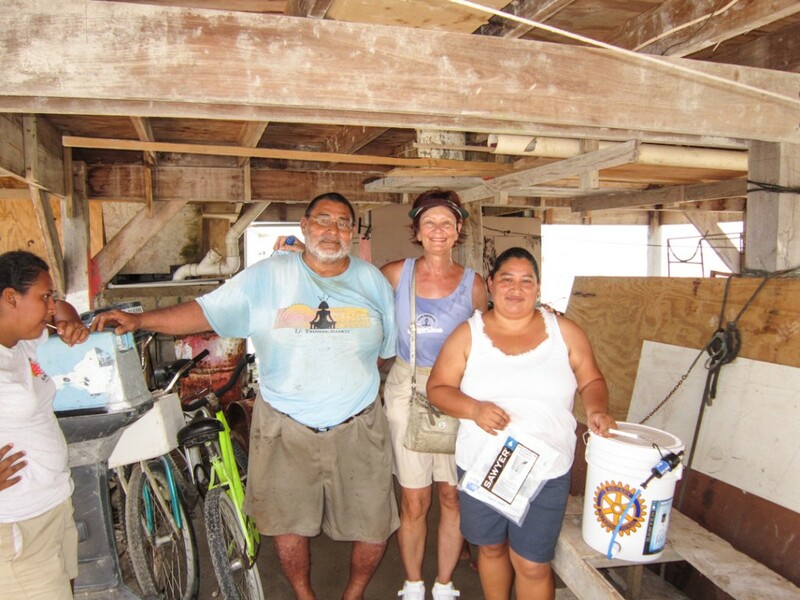 After learning of the water contamination and the challenges faced by the San Mateo residents, Kuffner engaged the Rotarians in Belize and together, they worked to introduce the first phase of a Rotary Club filter program. 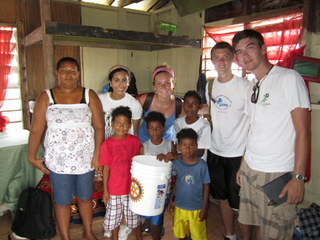 Belize Rotary Club committed to 200 water filter buckets for San Mateo residents. 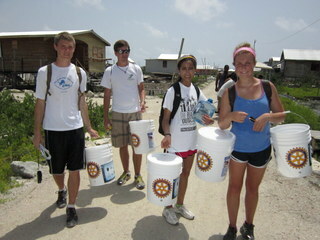 Over the last 16 months, Rotary Club filters have been distributed in the San Mateo community. 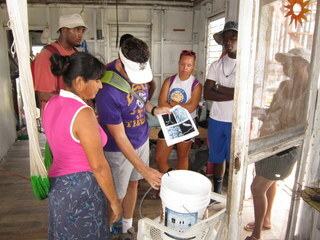 With the help of local students and community member Glenda Rancharan, they have been busy training residents how to use the Sawyer water filtered bucket. According to Kuffner, much needed help came from Park Scholars of North Carolina State University, USA. Park Scholars are selected based upon their scholastic achievements, leadership qualities, and commitment to community work. Local San Mateo resident and high school student, Lionel Cornejo also assisted and was instrumental in translating for the group when necessary. By the last day of training, Lionel was aiding with hands-on training. With 200 water filters given out, this completes the first phase of the program and hopefully there will be more help in the near future. Kuffner explained that another of the objectives of the Park Scholars while on the island was to identify a meaningful San Mateo project for their 2014 trip back to the island. Their hope is to have the Park Scholars return each year. “Their goal is to develop a long-term strategy to assist with problems in the San Mateo community,” said Kuffner. Meanwhile, the Rotary Club also plans to submit another grant to obtain more filters in 2014 so that San Mateo residents and Ambergris Caye could receive additional Sawyer water filters next year. San Mateo residents who have not yet received a Sawyer water filter, but still need one, can contact Glenda Rancharan at 664-9936. 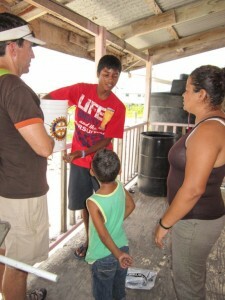 There is a strong possibility that The Rotary Club will obtain additional filters for Belize in the future. San Mateo residents on Glenda’s list will be the first to be offered a filter when they are available. The Millennium Development Goal (MDG) target is to reduce by half the proportion of people globally who are without access to basic sanitation and clean potable water by 2015. Photos provided by Ann Kuffner.